I know I’ve been MIA for several months now. I’m sorry I didn’t write or call or tweet. Can we still be friends? All jokes aside, I really can’t remember why I decided to take a break. I didn’t just let my blog slip into oblivion, I shoved a bunch of things onto the back burner. The year started off great, with a list of projects and goals I had every intention of accomplishing. But, as usual, I didn’t. Home projects went undone. Blog updates went unwritten. Dinner menus went unplanned. Do you know what happens when Menu Plan Monday goes down the toilet? Nothing good, I can assure you! I went over my monthly grocery budget several times, thanks to the dreaded “What should I make for dinner?” question that seemed to run through my head at 4 o’clock nearly every afternoon! NOT planning ahead results in a lot of last minute trips to the supermarket. I’ve learned my lesson, trust me. Yesterday was the first day of summer (can I get a WOOT WOOT?!?! ), so with the new season, I’ve come up with a new list of goals. With the help of my son, I also created our first “bucket list,” chock full of all the places we want to visit and the activities we hope to accomplish by summer’s end. Happy New Year folks! May 2012 be a healthy and prosperous year, spent with those you love. After lots of thought, I finally decided to buy a potato ricer. What’s it used for? 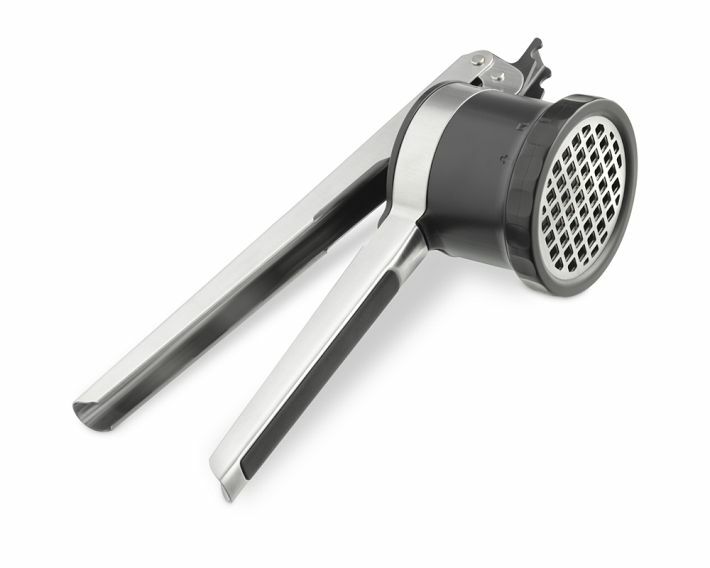 Potato ricers help you achieve the fluffiest, lump-free mashed potatoes you can imagine. You can also use it to rice potatoes to make gnocchi, which I hope to learn to do one day. The ricer shown above, made my OXO, is available exclusively at Williams-Sonoma. It has an adjustable disk that allows you to switch from fine to medium to coarse settings. With Thanksgiving coming up, I wanted to make sure my mashed potatoes were smooth, buttery and delicious. I’ll let you know how they turn out!